Thanks to the fine folks at Trash Palace, the Dr. Satan Duology (Dr. Satan and Dr. Satan and Black Magic) are now available with English subtitles. These movies are so undeservingly obscure that they each have only a dozen votes on the IMDB rating board. Hopefully this new subtitled DVD release will give them a wider audience. 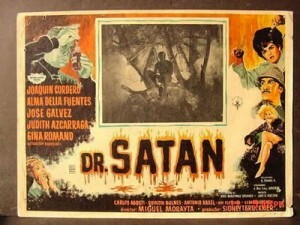 Dr. Satan (1966) introduces the titular character, the handsome but basically unemotional Dr. Arozamena who in his spare time works as a mad scientist, zombie master, and minion of King Devil. As a mad scientist he’s developed a formula to bring back the dead as zombies under his control. As a zombie master he sends his creatures out on various mission. As a minion of King Devil, he does the work of the underworld fiend, in this case fronting an organization who’s bringing counterfeit “dollars” into Mexico. Why King Devil needs the cash is not revealed, but, after all, money is the root of all evil. 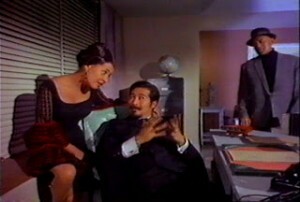 Dr. Satan’s opponent is a somewhat feckless Interpol agent and his assistant, a beautiful female Interpol gal, whom the agent is continually, lamely, hitting on. Dr. Satan has his own helpmeet, the beauteous Luisa, who has the most bounteous hair I have ever seen. The black and white photography is fantastic; the sets are reminiscent of the best of the 1930s Universal films. 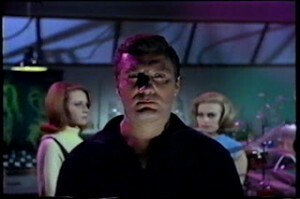 The screenplay’s blend of fantasy, science fiction, and crime is, if not unique, quite unusual. Joaquin Cordero’s (one of Mexico’s most popular and prolific actors, who is still active today) is a strange but effective melange of unemotional, world-weary cynicism. Head over to Trash Palace and get a copy of this rare, very strange, and quite entertaining movie. 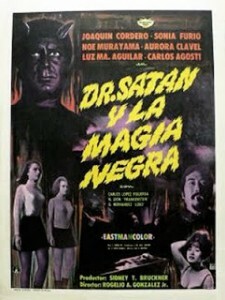 Dr. Satan and Black Magic (Dr. Satan y la Majica Negra) is a direct sequel (1968). It’s shot in color, which lessons the Gothic atmosphere of the first film, but the wild color tones are oddly psychidelic and thus appropriate for the day. The movie starts with Devil King awakening Dr. Satan from his eternal rest (some weird stuff must have gone down between films) and the good doctor pines for his return to cosmic oblivion for the rest of the film. 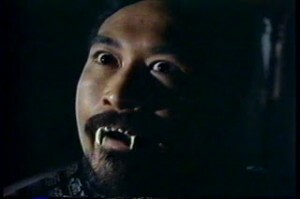 This time around one of King Devil’s rivals, the ever-excoriated Lucifer, is backing a Chinese vampire-sorcerer named Lei Yin, who has acquired (ie, killed the inventor) the magical alchemical process of turning base metals into gold, and for whatever reason (professional jealousy?) King Devil wants him stopped. First things first. Dr. Satan sets up a medical office and, by placing a want ad in the paper for office help, recruits him some zombies. This time around they’re chicks in mini-skirts, go-go boots, and tight sweaters, who at least have more eye appeal than your average zombie. The ensuing battle is one of evil vs. evil as a couple of feckless (again) policemen wander through the plot. Who wins? You’ll have to get the movie and see.